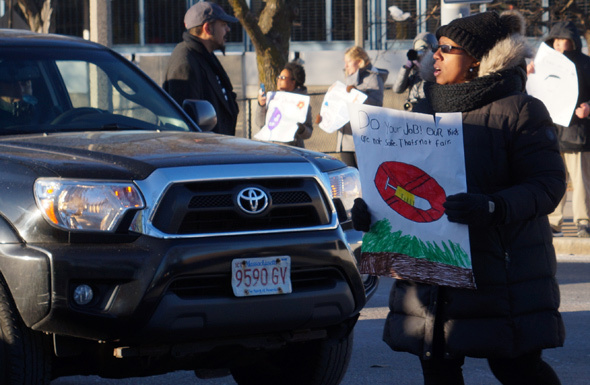 Parents, teachers and community members blocked traffic at Melnea Cass Boulevard and Albany Street after school let out this afternoon to demand even more action from the city to get needles and drug supplies out of the school playground and field. Read more. WBZ reports the School Committee put Fred Foresteire on paid leave. The committee authorized spending $50,000 for an independent investigation of Foresteire, who has been Everett school superintendent for 30 years. WCVB reports a sixth-grader was packing pepper spray when it accidentally went off in a classroom at UP Academy today. Boston city councilors agreed today to focus some attention on problems ensuring BPS secondary students can get to schools - and after-school activities and jobs - in a far-flung city with an unreliable public-transit system, and will schedule a formal hearing on the matter. Read more. WBUR reports BPS is immediately stopping all suspensions of kindergarteners and first and second graders and will limit suspensions of older elementary students - in response to a threatened lawsuit by Greater Boston Legal Services. An outraged citizen with two sons at the Joyce Kilmer School on Baker Street files a 311 complaint: Read more. Boston school officials said last night that the West Roxbury Education Complex building almost didn't open for classes last month - and that emergency repairs done on it so it could pass inspection will only hold out for the rest of the school year. Read more. Word is starting to come out tonight of schools that BPS officials want to shut as part of an ambitious program to consolidate Boston students into fewer, but modernized, school buildings. Among the first to go under the BuildBPS program, Start Smart BPS reports, are the West Roxbury Academy and the Urban Science Academy. Read more. Laura Perille makes the announcement in a Globe oped piece. City Councilors Andrea Campbell (Dorchester) and Kim Janey (Roxbury) want to look at ways to increase black and Latino enrollment at the city's three exam schools - including possibly replacing scores from the ISEE exam now used to help determine entrance with results from MCAS tests. Read more. WBZ reports Holy Name Parish on Centre Street was evacuated this morning after one student fell ill during a mass and several others complained of nausea. Parents will walk from the MDC rink to the School Committee meeting in Everett tomorrow evening to support teachers at the Parlin School following an incident last week. Read more. Interim School Superintendent Laura Perille says BPS will be beefing up a busing hotline to handle calls for parents wondering where buses are tomorrow (617-635-9520), but says she's hopeful there won't be a repeat of last week's charter-school problems, which saw some students waiting more than two hours for buses - if they came at all. Read more. WBUR reports on the new $73-million Dearborn STEM Academy - BPS's first all new school in years - which opens for grades 6-12 next month. The Dorchester Reporter reports the state has appointed BPS veteran Michael Contompasis as receiver of the Dever School on Columbia Point to try to turn around the low-ranking school. Contompasis long served as headmaster at Boston Latin School before serving as superintendent and BPS COO. He retired, then went back to BLS as interim headmaster in 2016 after Headmaster Lynne Mooney Teta quit following the Black Lives Matter controversy there. Schoolyard News spends some time with the recent report that analyzed the performance of BPS's five-year-old school-assignment system, the one that was supposed to improve choices for parents and their kids, but didn't if they weren't white or Asian-American. WFXT reports on the theft of the wheelchair Maliyah Rodriguez, 6, uses to get around. The Globe gets a copy of a report on the MIT-devised school-assignment system BPS used to replace the old zone system several years ago with the hopes that every elementary-school student in the city would be given a choice of at least one high-quality elementary school. The report found the system is working well - for kids in predominantly white neighborhoods.